New from Raro Video USA is an Italian production of Oscar Wilde's classic story of eternal youth - The Secret of Dorian Gray. Starring Helmut Berger as the title character, this version is different from the novel by incorporating contemporary (for the time) themes of sexual liberation and fashions. Considered shocking when released, the film definitely has its moments but is still pretty tame by today's standards. Dorian Gray (Berger) is a wealthy young man who falls in love with an amateur actress. After modeling for a friend's portrait, Dorian sees his own beauty and realizes that it is more important than anything else in the world. After his love commits suicide over his rejection of her, Dorian begins to live a life of debauchery; relishing in his own beauty and wealth. He is shocked to find that as he remains youthful over time, his portrait grows old in his place. He hides the portrait from the world in hopes of staying young forever. The Secret of Dorian Gray is a nice slice of the taboo-smashing 70s, featuring a wonderful performance by Helmut Berger. Updating the story into the (then) present time works well and proves how timeless Wilde's story is . 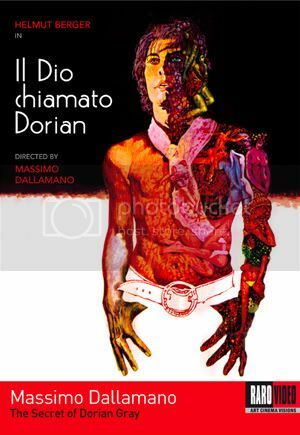 Dallamano's use of vibrant colors, hallucinogenic lights and an attractive cast makes the film a joy to watch. The supporting cast features such notable names as Herbert Lom, Richard Todd, Margaret Lee and Maria Rohm and they all do a great job creating the excess-filled world of Dorian Gray. Included in this new release by Raro Video USA is a new Digital HD transfer from the original 35mm negative, an interview with the assistant director Maurizio Tanfani and a fully illustrated booklet.